Nestled in the heart of the Rocky Mountains, Bozeman is an incredible town with a population of about 50,000 people that represent a bright blend of cultures and traditions. While still maintaining the charming atmosphere of a small town, the impressive community boasts a huge variety of outdoor recreation. As a matter of fact, the city maintains an incomparable quality of life- one of the best in the United States. Bozeman’s population was once mostly miners, but slowly, and steadily, the town has grown to reach its contemporary status of a well-developed tourist and agricultural center. The climate in Bozeman is temperate, and the air is very clean. Surrounded by thousands of acres of lush forest and bright green landscape, Bozeman has a bewildering number of outdoor activities. Take advantage of Bozeman’s natural environment by hiking, biking, camping, fishing and skiing! The world-class Museum of the Rockies, housed on Montana State University’s campus, shares the captivating story of the people of the Rocky Mountains, as well as the history, geology and the wildlife of the area. The museum’s masterpiece, however, is the dinosaur collection- life-sized skulls of a Tyrannosaurus Rex, and an even larger one of Gigantosauruscarolinii! The museum also features a planetarium, an Indian artifacts collection, pioneer exhibits, Western art exhibits and dinosaur eggs found on Montana’s territory. Bozeman is a wonderful starting point for a memorable adventure to the unique Yellowstone National Park. It’s only 80 miles away from the city, and a magnet to more than 3 million people who visit per year! Bozeman’s residents and guests contribute to the special authenticity of the place: professors, ski enthusiasts, artists, ranchers and entrepreneurs are attracted by the endless recreational opportunities, by Montana State University or by the promise of a slice of traditional Americana. Downtown is home to many architectural examples of the past centuries. A stroll down Main Street will usher you into historical times when downtown merchants used to outfit miners and ranchers with provisions. More than 100 quaint shops and wonderful restaurants will tempt you! Art aficionados will be surprised by the dynamic cultural life thriving in the city: museums, galleries, opera, ballet, symphony, theatre, rodeo and street artists. Events like the Sweet Pea Festival, the Montana Winter Fair, the American Indian Pow Wow and the Gallatin County Fair gather many tourists all year round. 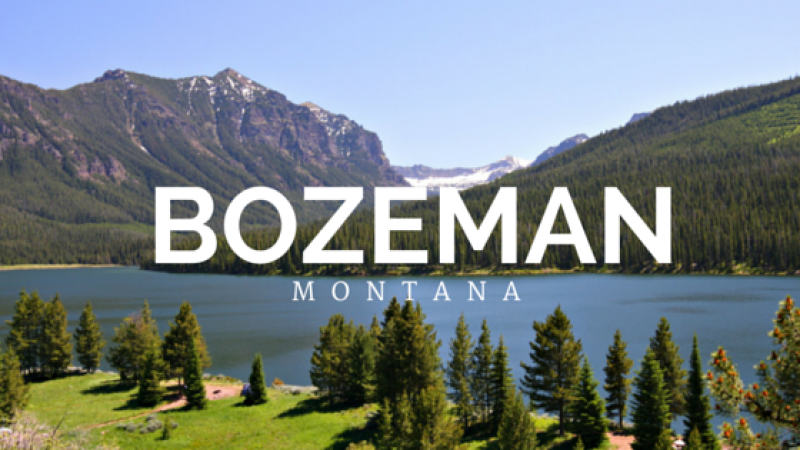 Experience Bozeman like a local! Stay in a vacation home that’s filled with character and charm. Check out this elegant Bozeman vacation rental, and click for more information.